My name is Carole and I have had the honor and pleasure of serving on the Board of Cope Family Center for nearly six years. During this time, I have worked alongside dedicated volunteers and skilled staff to help carry out Cope’s mission to empower parents, nurture children and strengthen communities. Recently, I joined Cope’s staff and volunteers in serving families affected by the wildfires that devastated our community. As a trusted community organization that helps families manage crisis and trauma day to day, Cope’s expertise was invaluable in supporting families during this difficult time. I saw firsthand how the staff’s compassion and professionalism put children and parents at ease and helped them access essential emergency aid services. I am writing today to ask you to make a donation to help more families provide a secure, loving and healthy home for their children. Your support will give parents the education, resources and support they need to manage raise children who thrive. 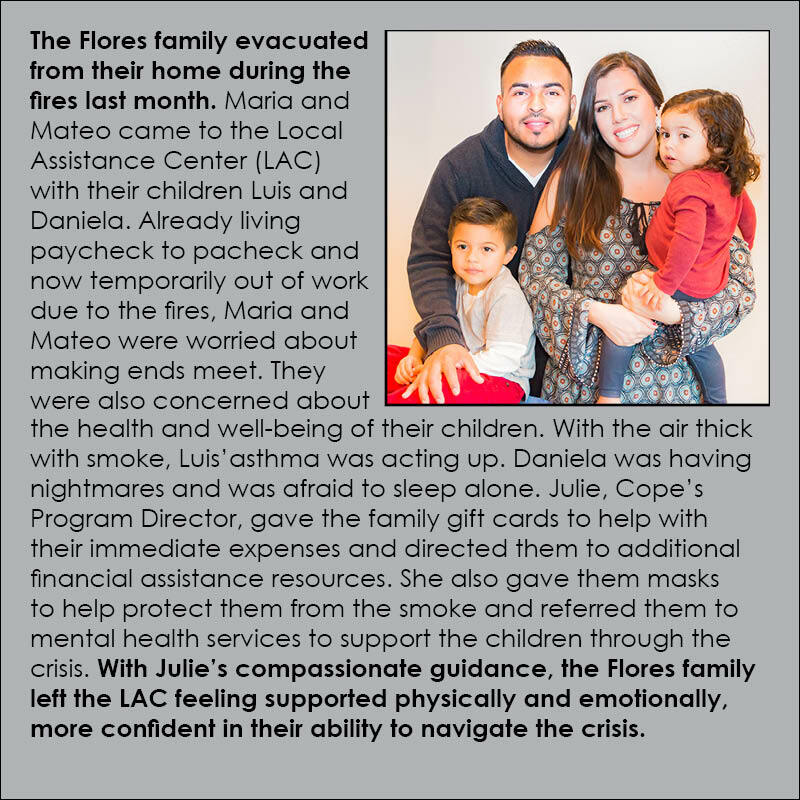 In my volunteer role at Cope, I have personally witnessed the life-changing impact Cope has on Napa County families, like the Floreses. Poverty. Mental illness. Substance abuse. Childhood trauma. Natural disaster. These are just some of the challenges that can cause significant stress in the family. Despite parents’ best intentions, their struggles can impact their children. Without support, the stress can sometimes become too much to manage and children can be at risk for neglect and even abuse. Cope is here to provide the support parents need to manage stressful situations and challenging life events so they can give their children a brighter future. Every day, parents come through Cope’s doors facing a variety of struggles but they leave encouraged and equipped to handle life’s challenges and manage the demands of parenting. Our work is possible because of your support. During this season of giving, I am personally asking you to demonstrate your commitment to Napa families by making a tax-deductible contribution to Cope Family Center. By giving parents the support and resources they need, you are keeping children safe and giving them a brighter future.